Finally, as I promised, we have gotten the KHV Auctions back on track. This will be a live auction that can be monitored by the bidders upon visiting the On Line Auction web site. There were a number of alternatives that we have considered and explored to avoid high fees and costs associated with most online auctions. This web site provides us with the most flexibility and yet preserves the most return on the bidder’s final auction dollar amount. Now we need you to get the word out to all of your koi clubs, enthusiasts and friends that the auction is underway. The first one will probably be the most difficult to obtain the full gammet of potential bidders until our AKCA/KHV Project supporters become aware that this will be a common and ongoing occurrence until further notification from myself or our Director, Mr. Spike Cover. The bidding on this first item will begin on Wednesday, Sept 5, 2007, at 7:00 PM PDT and will go for fourteen (14) days, bidding will be closed on Sept. 19, 2007 at 7:00 PM PDT. There is a reserve dollar bid amount and should we not achieve this amount the item will then be reposted for bidding. You may preview the auction page by going to http://www.onlineauction.com/index.php?page=auction:view_item&auction_id=374405. In order to bid you will have to register with the Online Auction. This only involves your name and e-mail address, no costs, no sign up fees to the bidder or viewers. Please, let's get this information out to as many as possible to raise badly needed funds for the AKCA/KHV Funding Project. Shu Stewart Tu and Betty Tu of Richmond BC are the proud new owners of the Peter Enfield Beni Kikokuryu slate auctioned to benefit the AKCA KHV Project at the 2007 PNKCA Convention. Koi Slate is approximately 24 inches tall and koi inlay is about 15 inches tall. Peter and his wife Silvia live in Oregon and are avid koi hobbyists. Peter has been a long-standing member of the Pacific Wonderland Koi club and the Northwest Koi & Goldfish Club. Leaded glass windows of koi and water plants grace not only the front door but appear in overhead skylights. Peters engineering skills are demonstrated here once again with the special design of the lead glass panels to prevent them from collapsing downward while hanging flat inside the skylights. Once Peter perfected the art of lead glass windows, his passion as an artist and koi hobbyist surfaced to an all-new level that made him internationally known for the beautiful koi slates that he makes. Peter has developed a technique that allows him to take the photo of a specific koi, scale it to the size of the slate to be used. Then working the slate with tools to create the outer frame for the fused glass koi that will emerge from the center of the slate. There are many steps that Peter’s hands perform as an artist that provide the final beautiful slate artwork that are sought after internationally. Peter starts with a photograph of a Grand Champion Koi to create his glass patterns. He takes a beautiful piece of gray slate and carves out the powerful koi shape. 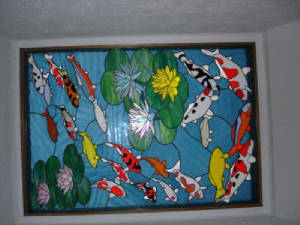 Next he takes special fusible stained glass and cuts it into the koi's unique patterns. The pieces of cut glass are put together like a jigsaw puzzle and then fired in a special glass kiln to fuse it into a solid glass koi. Then the fused glass koi is fitted into the indentation in the prepared piece of slate to create an extraordinarily beautiful and unique piece of koi art. Unlike our perishable pets, Peter's koi art is timeless. His koi colors will never fade. The vibrant reds, porcelain whites, and shiny ebony blacks are perfect. Peter creates the beautiful image of Grand Champion koi floating on the surface of a deep dark crystal clear pond. Many koi hobbyists, koi professionals and international breeders have been trying to obtain one of Peter's koi/slate art pieces for years, however; Peter does not sell his creations. Until recently, one way to get one of Peter's koi slates was to win the Annual AKCA Bob Spindola, Champion of Champions, Award. This award and accompanying piece of Peter's koi art is given to the top Koi chosen from photos of all the Grand Champion Koi winners at Koi shows in the USA. Not an easy thing to accomplish. 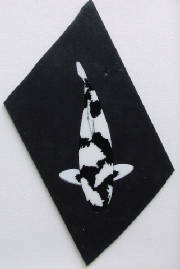 You might also get one of Peter's koi slates at a special auction at events like the annual AKCA National Seminar. Peter has donated these beautiful slates to koi associations and clubs to honor special dignitaries and to be used as fundraisers at auctions of clubs. Peter’s most recent and generous donation and gift was to provide slates to the Associated Koi Clubs of America (AKCA) – KHV Project. 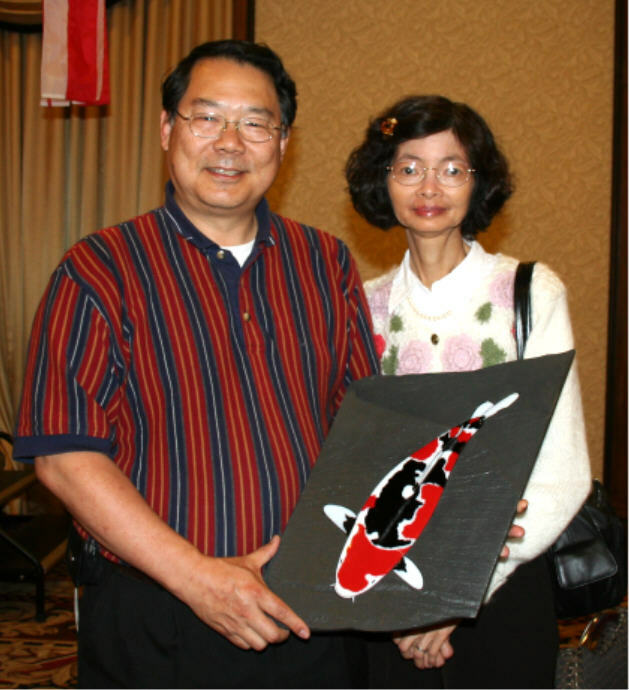 This is Peter’s way of providing funding for the education and research in the eradication of KHV to the koi hobby. This is your opportunity to own one of Peter's unique pieces of koi art and help the AKCA PROJECT KHV at the same time. Once these slates are gone, they undoubtedly will become collector items in the koi world. At this time it is not known if Peter will make additional slates available. Below are several koi slates that have recently been auctioned through the AKCA/KHV Project.